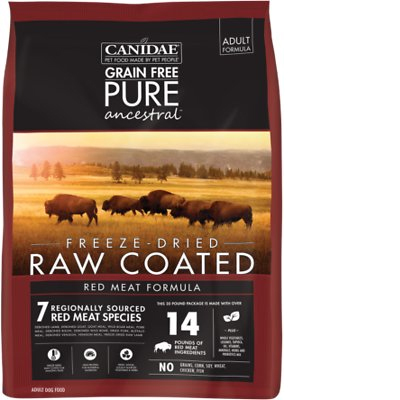 Canidae Grain-Free PURE Ancestral Red Meat Formula is a high-priced dry dog food with great quality. This product has no controversial ingredients, which also means no artificial preservatives, colors and flavors. The food is high in carbs, but offers excellent meat and fat quality. Canidae has had a below-average number of food recalls. The company was pretty transparent when answering our questions. In short, Watchdog Labs recommends this product. This food has a fair amount of protein but is somewhat high in carbs, which is lowering the fat content slightly and making it less nutritionally balanced compared to other dog foods we evaluated. Carbohydrates are cheap so they keep the food’s cost low. They are nutritionally useful to dogs in the right amounts, however, high amounts of carbs can reduce the much-needed meat-based protein and fat content. This product has a relatively high amount of calories. It’s important to understand how many calories you are feeding to prevent under or overfeeding. If your dog has fair to low activity levels, you may want to feed less than the labels recommend amount, since high-calorie foods like this are often feed to more active dogs who require a higher amount of daily calories. It's helpful to know that weight loss foods often have fewer than 340 calories per cup, weight maintenance foods typically range from 340-380 calories, and high-activity dog foods are usually over 400 calories. Keep in mind, dehydrated and air-dried foods, like this one, usually have much higher calories per cup than other foods. Lamb, Goat, Goat Meal, Wild Boar Meal, Pork Meal, Carrots, Lentils, Potatoes, Peas, Tapioca, Bison, Wild Boar, Canola Oil, Suncured Alfalfa, Sweet Potatoes, Dried Pork, Buffalo Meal, Venison, Venison Meal, Freeze-Dried Lamb, Minerals (Iron Proteinate, Zinc Proteinate, Copper Proteinate, Ferrous Sulfate, Zinc Sulfate, Copper sulfate, Potassium Iodide, Manganese Proteinate, Manganous Oxide, Manganese Sulfate, Sodium Selenite), Vitamins (Vitamin E Supplement, Thiamine Mononitrate, Ascorbic Acid, Vitamin A Supplement, Biotin, Niacin, Calcium Pantothenate, Pyridoxine Hydrochloride, Vitamin B12 Supplement, Riboflavin, Vitamin D3 Supplement, Folic Acid), Choline Chloride, Mixed Tocopherols (A Preservative), Squash, Parsley, Sage, Dried Enterococcus Faecium Fermentation Product, Dried Lactobacillus Acidophilus Fermentation Product, Dried Lactobacillus Casei Fermentation Product, Dried Lactobacillus Plantarum Fermentation Product, Dried Trichoderma Longibrachiatum Fermentation Extract, Basil. Contains A Source Of Live Naturally Occurring Microorganisms. The average dog food we reviewed has 39 total ingredients, with 1 controversial ingredient. 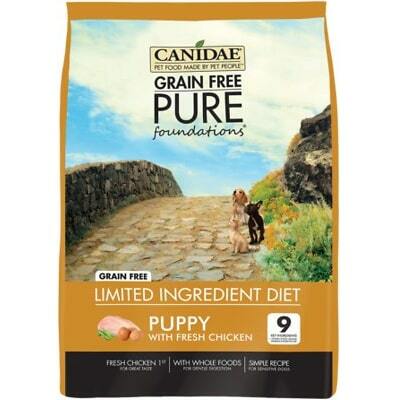 There are not have any controversial ingredients in this Canidae product. Lamb is generally a healthy dog food ingredient that adds protein, fat and other healthy nutrients to the dog food. Raw meat contains about 75% water which is cooked off during the making of dog food. This leaves only a fraction of the protein content in the final product's weight. We recommend looking for dog foods that also include meat meals in the first five ingredients (pre-cooked meat powder that contains four times the amount of protein). Goat is generally a healthy dog food ingredient that provides nutrients like protein, fat and iron to dogs. Raw meat contains about 75% water which is cooked off during the making of dog food. This leaves only a fraction of the protein content in the final product weight. We recommend looking for dog foods that also include meat meals in the first five ingredients (pre-cooked meat powder that contains four times the amount of protein). Goat is generally a healthy dog food ingredient that provides nutrients like protein, fat and iron to dogs. Meat meals are the result of cooking. Water is removed from meats to create a protein-rich meal powder. Meat meals contain about four times the protein meats do, so generally, they're a good source of nutrients. Wild boar (also known as wild pig) is generally a healthy dog food ingredient. Meat meals are the result of cooking. Water is removed from meats to create a protein-rich meal powder. Meat meals contain about four times the protein meats do, so generally, they're a good source of nutrients. Pork meal is generally a healthy dog food ingredient. Meat meals are the result of cooking. Water is removed from meats to create a protein-rich meal powder. Meat meals contain about four times the protein meats do, so generally, they're a good source of nutrients. There are no controversial ingredients in this food. Canidae is manufactured in the United States. This dog food is the Canidae Ancestral Red Meat Formula, so it's packed full of meat. It’s fantastic to see that every meat source is transparently named on the label. The wide range of meat includes Lamb, Goat, Goat Meal, Wild Boar Meal, Pork Meal, Bison, Wild Boar, Dried Pork, Buffalo Meal, Venison, Venison Meal, and Freeze-Dried Lamb. This is great because it shows you the species the meat is coming from. Most of the fat content is going to be coming from the meat, and in addition, it has Canola Oil as a fat source. This product does not contain any controversial preservatives. It’s important to know that ‍not all artificial preservatives are bad. That’s because they serve an important purpose, which is to prevent food from spoiling. However, we consider 11 artificial preservatives controversial because of their potential link to cancer and other serious health conditions. There are no artificial colors in this product. 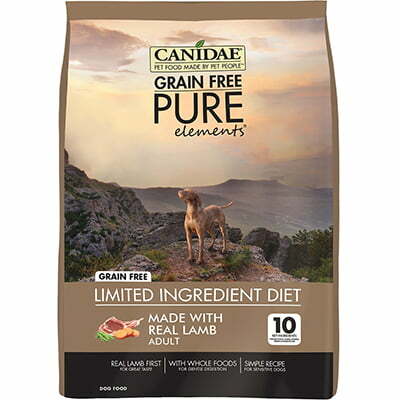 Canidae also does not include any artificial flavors. This is great, no artificial preservatives, colors or flavors. This brand has one recall which is below the average number of recalls for dog foods. Canidae Dog Food, Chicken Meal and Rice, Net Wt. 30 lbs, Guaranteed by: Canidae Corporation, San Luis Ohispo, CA 91401. 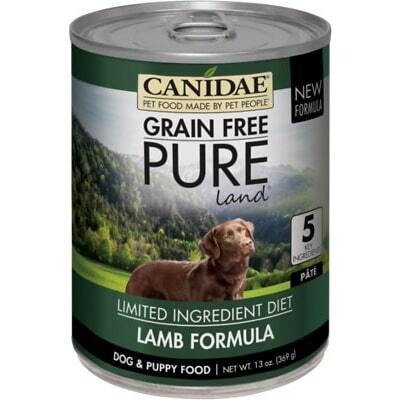 Canidae Dog Food, Lamb Meal and Rice, Net Wt. 30 lbs, Guaranteed by: Canidae Corporation, San Luis Ohispo, CA 91401. Canidae Platinum Senior & Overweight, Net Wt. 30 lbs, Guaranteed by: Canidae Corporation, San Luis Ohispo, CA 91401. Canidae Dog Food, All Life Stages Formula, Net Wt. 30 lbs, Guaranteed by: Canidae Corporation, San Luis Ohispo, CA 91401. Product was found to be contaminated with Salmonella. Canidae did not respond to our first email, or the second that was sent a week later. We then placed a call and received answers to the questions below. Since the call was not recorded, the following responses are paraphrased - they should not be seen as exact statements from the company. They do have one on staff, but the name could not be shared. The previously mentioned on-staff veterinary nutritionist. The Canidae representative was unsure if they perform these feeding trials. No, it can’t be, but there is a virtual tour on the website. A detailed answer was provided including the ingredient testing process and a description of the on-site laboratory and the testing it performs. Ethos is the name of the manufacturing facility that is owned by and produces Canidae.